He has completed the master course. Turing the patient’s head on the upper side, the patient has a strong pain on the cervical spine, from no.6 to no.7. Two days ago he had an onset f the pain, and the pain bocame more strong gradually. On the arrival at my clinic, a very slight movement on the cervical part caused a strong pain. The range of the pain became wider, and the pain arrived at the levator scapulae muscle. There is a problem on the inner rotation of the shoulder joint. He had a strong pain on the neck, so when he looked away, the body also looked away with the neck. The muscles from the cercvical part to the shoulder (levator scapulae muscle, splenius muscle, upper trapezius muscle, the scalene muscle, sternomastoid muscle and so on) are very rigid. The sternomastoid muscle, the masseter muscle, the upper trapezius muscle, levator scapulae muscle, the rhomboideus muscle, the broadest muscle of back, the triceps muscle of arm. All of these tecnique are what I have learned from Master Kochi. The important point is that I have early identified the cause of the pain. Elevating the arm, the patient has the shoulder pain. Elevating the wright arm, the patient has the pain on the shoulder joint. About from 2 weeks ago, the patient has the symptom. When the patient gets up, the patient feels a sense of discomfort. The pain bocome gradually more and more strong. However the patient moves, the patient feel the pain on the shoulder. Especially, he has strong pain on the front side of the shoulder, around the lesser tubercle.I began the ancylo on the shoulder joint which I have learned from Master Kochi. Enlargement of the range of the movement of the shoulder joint. I found a remarkable change of the level of aching pain on the shoulder point. In the future treatment, I would like to identify the couse of the improvement of the patient’s shoulder’s condition. I would like to invest time to know this. When the knee bears the weight in walking, the patient has a strong pain on the knee. He has undergone rehab in the hospital and the bone specialist. He has gone to many other clinics. If the patient walks by himself, he has to hobble, nursing his left knee.Probably because of the induration of the opposite gluteus medius muscle and of tensor fascia lata muscle, his hip joint does not function well.I provide the patient with treatment,using the Kochi Method Theory that tells that the lower back pain has a relationship with the pain in knee. I have invested time into the treatment on the pelvic part. Like the theory of Kochi Method, the relaxation on the groin has brought about the improvement of the condition of the pain in knee. The patient had pain on the shoulder when the patient extended the wright arm to take the baggage on the rack. So the patient has come to the clinic. Elavating the wright arm, the patient has strong pain on the shoulder. Elavating the arm en avent, the patient has the pain most strongly. The patient has 85 years old and has few muscles. But I have dutifully obeyed the thing that I learned in Kochi Method Seminar. Thinking of the age of the patient (85 years old), I shortened the duration of procedure. The duration of procedure was about ten minutes. The level of the pain also was very improved. I am very happy that the patient was very content. Next time, I will do the treatment for the relapse of the pain. Man of 50 years old. The patient has strong pain on the shoulder. The duration of procedure was about twenty minutes. Treating the shoulder-pain,the client was surprised, but I also was very surprised. I thank for master Kochi. Next time, I would like to treat with the tecnique of the acpuncture. Dr. Hoshino’s case: Why a therapist was able to ease drastically severe pain in his client’s knees? There was a client who had severe pain when he bended his knees around July last year and went to hospital for treatment. The X rays showed no bone abnormality and he was taking pain-relief injection twice a month. However, his condition showed no recovery. Then, he had strong pain in his knees when he turned over in bed and he couldn’t sleep. So, he visited Dr. Hoshino’s clinic by personal introduction. Dr. Hoshino had participated in Kouchi’s massage workshop about gonalgia remedy and practiced the method for the client, examining the affected area, checking the muscle pain and adjusting muscles as he learned from Mr. Kouchi. Surprisingly, the patient was able to get down on his knees after the treatment! The patient feels strains on the vastus lateralis muscle, but has no trouble with daily life. He was delighted to say “It’s really great! “. The case shows that Kochi Method to rotate gastrocnemius muscle was successful. Dr. Hoshino felt confident about himself because he had never been successful in treating severe pain. 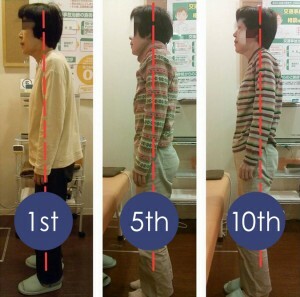 His client and he were surprised to see that the level of his knees pain made a drastic improvement and he became to be able to bend his knees after adjusting quadratus lumborum, erector spinae muscle and biceps femoris muscle, gastrocnemius muscle. 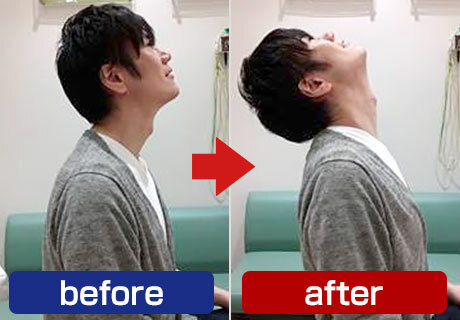 The patient said he was not able to raise himself up after sitting on his heels, but he can do it now smoothly thanks to Kouchi’s massage method. He was happy and said “I was able to raise myself up!”. 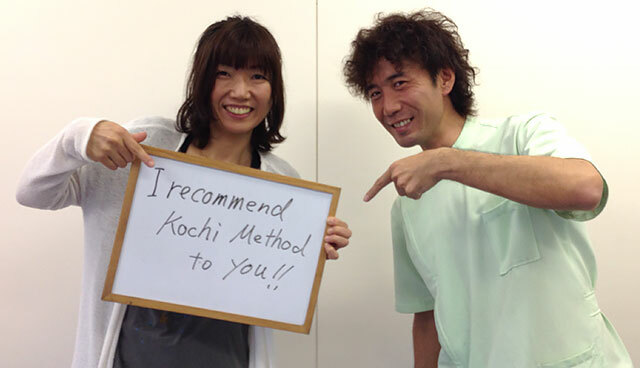 Dr. Hoshino realized Kochi Method is really great from this successful experience. He has made his mind to master the technique. I am sending a case study of treatment using the Kochi Method! Raising the right arm results in severe shoulder pain. Pain during sleep at night results in the inability to sleep. As shown in the photo, prior to treatment, about 90º the flexion of the shoulder joint produced pain throughout the entire shoulder. 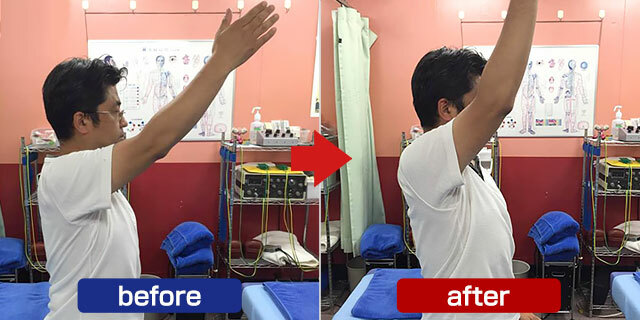 Conducted the examination used in the Kochi Method to discover that although there was pain in the right shoulder, the pain in the right shoulder did not change at all following the examination. This led to the diagnosis that the cause of the pain in the right shoulder was coming from a different area. Please see the photo to the right to see the results of treatment. The client raised his arm so quickly that the photo is out of focus. His pain was relieved so much that he was able to raise his arm with speed. Treatment time was approximately 30 minutes. I was surprised that such change could be achieved in 30 minutes. It is thanks to your teachings, Dr. Kochi. The Kochi shiatsu massage Method is a truly amazing technique. This technique has given me more confidence. I have learned various techniques but the Kochi shiatsu massage Method is No. 1!! This photo shows a side view of the treatment of a 60-year-old woman. The photo to the left shows her state prior to her first treatment. At this point, the patient had knee pain while walking. The diagnosis indicated that the forward tilt in her neck and forward body lean while walking created stress on her knee. While she still leans forward while walking, her standing posture has improved. I am Murohara, a Japanese shiatsu massage therapist. I am 52 years old. I participated in the Kochi shiatsu massage Method seminar and have continued to be amazed by the greatness of its technique. I have completely stopped all of the techniques I was using in treatment and now only use Kochi Method for treatment, and I am learning the greatness of its techniques more and more by experience. Please see the before/after photos. Actually, in the advanced edition of Kochi Method techniques, there is an unexpected and difficult-to-believe technique which says that “just wearing a T-shirt makes the body looser”. If you see the photos, the one on the left is a person bending forward wearing a T-shirt with nothing done to it. 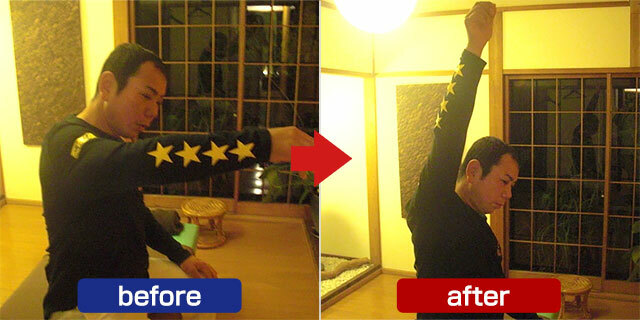 The one on the right is a photo of someone bending forward wearing a T-shirt using a “make the body looser just by wearing clothes” technique of the Kochi Method. 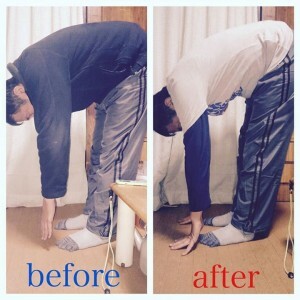 In the photo on the right, the person is bending forward and touching the ground with their hands, and they say that it was the first time they can remember in their lives being able to reach the ground with their hands. This was also the first time I ever learned this technique and I had my wife take a photo of me performing it for the first time, but I didn’t think it would change this much. Actually, I later taught it to my wife as well, and she was also able to do it. 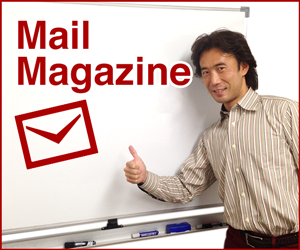 Naoya Kochi, the originator of the Kochi Method, is a “fabulous doctor” to me. 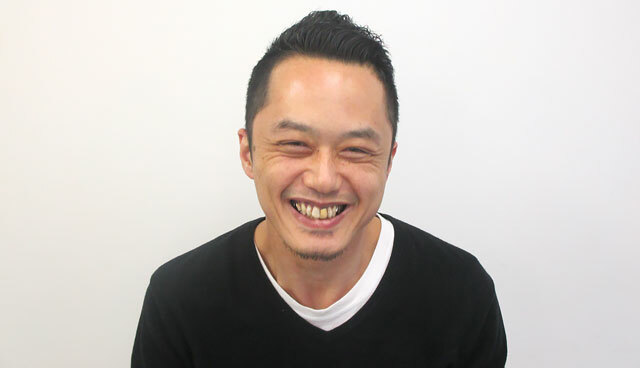 Naoya Kochi, the originator, says “You can create instant changes without touching the person’s body using not only clothes but objects”. It sounds totally absurd, but on this occasion I tried it and finally understood. 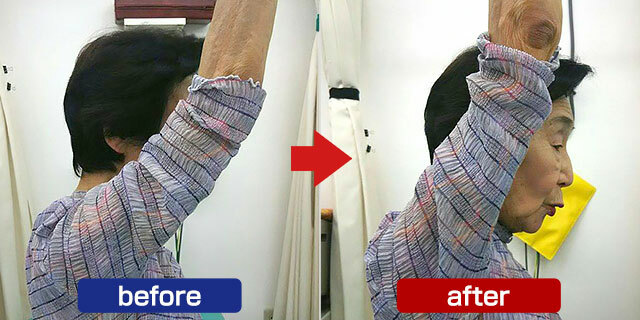 What if your client conducted the technique in Kochi Method on a T-shirt and wear to make the muscles in their body looser and you were able to confirm the change!? 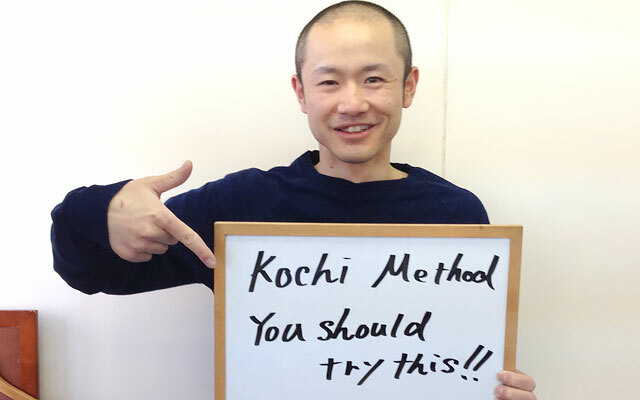 I heartily recommend that you learn the Kochi Method. I think it is a new method that exists nowhere in the world.